Yesterday’s private jet is today’s tofu dinner. At least that’s how it looks with American CEOs, who are coming out of the crisper to show off a brand-new lifestyle: joining the one percent of the United States population that abides by a vegan diet. Is veganism becoming the new polo club? There are plenty of powerful people who go vegan for health reasons, most notably former President Bill Clinton who changed his diet this past spring after undergoing major heart surgery so he can reverse heart disease and live healthy enough to see his potential grandchildren. Wynn sees it as a kind of health insurance plan when he persuades his employees to give up meat, dairy and eggs. For others, eating a plant-based diet is something that needs to be done for moral reasons, such as in the case of Twitter co-founder Biz Stone, who visited an animal rescue sanctuary in upstate New York and came home a vegan. Upromise CEO Tom Anderson is on the sanctuary’s board, and he says the only time his veganism becomes an issue is when potential business partners start trading hunting stories around him. Then there are those who go vegan for love, or, to impress a girl, which is how Kucinich started 15 years ago. According to Business Week, “the rise of the power vegan coincides with the rise of the vegan second wife.” Case in point — Rupert Murdoch and former Viacom CEO Tom Freston. Veganism also gives moguls a sense of control over their bodies that they already exercise everywhere else in their lives. Constant stress at work contributes to potential health problems, and while veganism isn’t a cure, it’s certainly a greater help than a meat-filled diet. In a country that loves its animal product industries, veganism is a challenge where a CEO can push himself to rise to the occasion. In a time when experience and time have become as valuable of commodities as money and consumption themselves, it makes sense that CEOs are amenable to adopting healthier lifestyles that eschew meat, eggs and dairy. In the long run, they see it as buying themselves more time and energy to continue the high-power lives they already enjoy. Regardless of the reasons, the fact that more and more of America’s elite are joining in on the vegan movement shows that a lifestyle free of animal products and by-products isn’t just for hippies or contrarians, as it has been portrayed for years. With these powerful converts comes more acceptance of veganism in the mainstream culture, as well as more awareness for the reasons why people choose to base their diets on plants rather than animals. Nice to know there are people at the top who GET IT! 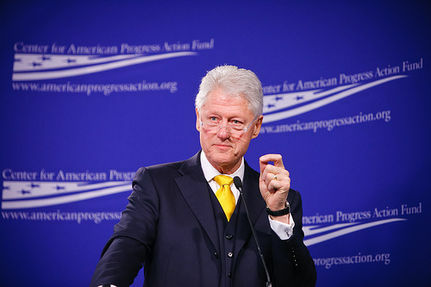 WTG, Bill Clinton, you look great! Good to hear that so many influential people are Vegans! thanks for sharing. it's especially great when people in positions of power or with celebrity are able to set good examples and lead the way for good causes. It matters who we eat-great article thanks!